This is one issue that I hear from customers using Dynamics NAV (formerly Navision) quite often is why does the Expected Receipt Date keep changing? 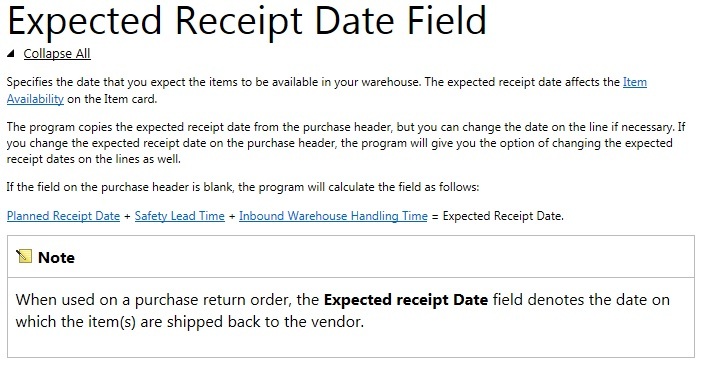 The Expected Receipt Date in Dynamics NAV is the main driver for inventory planning. Dynamics NAV uses this field to calculate the availability of the item. Based on this date, Dynamics navNAV calculates when the item can be received into your warehouse. On the purchase order, the field is on the header and on the lines. Dynamics NAV will only use the field on the purchase lines in the calculation. What the help doesn’t mention is that there are other fields that will affect the Expected Receipt Date. To test this, just create a purchase order and go to the Shipping Fasttab (or tab if you’re using the classic client) in your version of Dynamics NAV. The Safety Lead Time, Lead Time Calculation and the Inbound Whse. Handling Time explanation is pretty straight forward. In our test, the CRONUS database has 1 day on the Safety Lead Time. These dates work FIFO. So whatever date you change on the Purchase Order header will take precedent over what was entered before. Worst, when you update the dates on the header, you’ll get a message asking if you want to change the Purchase Lines, WHERE ALL THE INVENTORY CALCULATION TAKES PLACE! There are a lot of instances where the user will want to look at the purchase order header and get a feel for what is coming in what by who. Make sure the user know exactly what’s going on. An option would be to remove these dates from the header and force the user to enter the lines. But if you have long purchase order, this is not really an option. 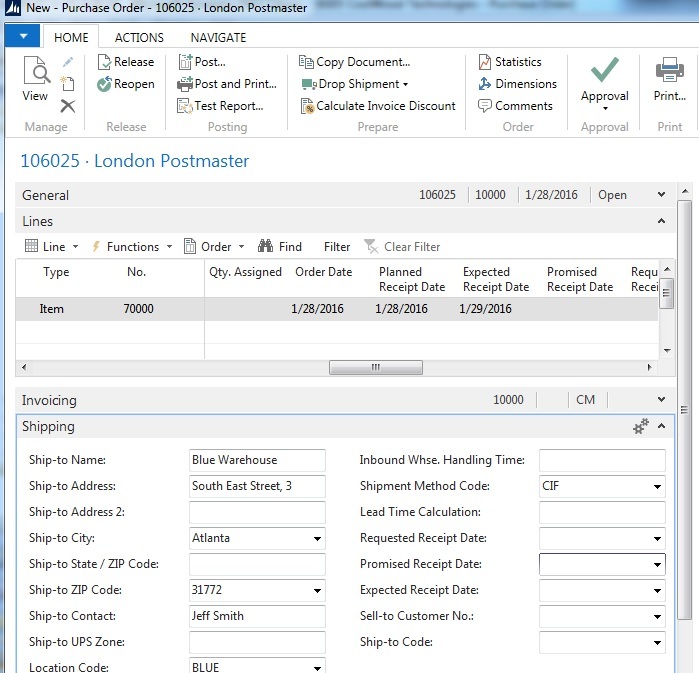 In the end, becareful about changing those dates when you’re entering purchase orders in Dynamics NAV!